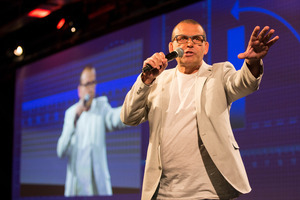 I have had some dealings with people inside the new Paul Henry show of recent weeks along with some of the sales team at Mediaworks and I find it intriguing to see the nature in which they are ‘selling’ the new venture. It’s being spoken of as a Goliath of a show that is going to take the world by storm which makes sense as Mediaworks is currently trying to ‘big up’ the product. I’m as interested as anyone to see the final product, but I wonder what the new show is actually going to achieve…other than save money. Radiolive has been the bit-player in a theatre that is talkback radio since it’s inception in 2005 with Newstalk ZB being dominant and not ever taking a hit from having competition in the market place. As an example when I was working 3 – 4 overnight shows on ZB I had the number one show in the country with an average or 100,000 – 120,000 listeners nationwide, per week consistently for 5 years. Over the same period, in prime time day slots, Michael Laws and Willie and JT on Radio live, 5 days a week had about 50,000 listeners. The same discrepancy could be seen if you compared drive show and breakfasts shows on the two stations and things haven’t really changed all that much. Yes there’s been a 5% growth here and a 2% drop off there, but for the most ZB is correct in their advertising that “daylight comes second.” Why there is such a discrepancy between the brands is for another day, but I think I can speak to that as well having worked for both brands. Up until 2014 there were two products on the Mediaworks brands, Firstline on TV3 and Marcus Lush on Radiolive, so to take both products and make them one will undoubtedly save money, not necessarily in year one as there is a major capital outlay for a new studio etc…but if you now have half (my assertion) the staff you had you are going to see savings long term so I can see the new Paul Henry product as a money savings product but as a challenge to ZB or indeed Breakfast on TVNZ…I don’t see that in the stars. I see no evidence that people will turn off ZB or TVNZ and head to the new hybrid show. TV3 and Radiolive, as individual entities, have put up good options in the past to challenge the status quo to no avail, in fact Paul Henry was one of those people when he work on the Drive show on Radiolive, which made no depreciable difference to Larry Williams audience on ZB. I don’t see this Paul Henry as anything other than the next incarnation of an attempt to take down the established order. Now, I like Paul Henry, so don’t see me as a ‘hater’ but we have seen very talented broadcasters before try and fail…why should this be any different. There is also one last issue that the producers of Paul Henry’s new show have to address, and it’s the elephant in the room right now, and that is that this idea that a cross media platform may actually deliver an inferior product to what is currently available. It might actually turn people off both products as the show tries to be a jack of all trades as it may end up being the master of none. The radio game especially has some very exact nuances that may be lost, overlooked or just impossible to achieve when making a television product. Is this going to be a television show that is broadcast on the radio, or a radio show with pictures…both of which will leave viewers/listeners of the lesser valued medium unsatisfied, or will it be a genuine hybrid of both radio and television? But my question is how will that work and is it even possible? My suspicions are that you will see an improvement on the audience for TV3 that won’t effect the Breakfast audience, and not a significant change to the Radiolive audience. You’re probably right. I don’t watch morning TV and have no plans to start. I enjoyed Marcus and it remains to be seen if Paul Henry can do the morning slot on Radio Live justice. I enjoy Paul Henry and was a fan of the the late night PH Show on TV3…………….cant see how an AM show can be anywhere near being as good. I listen to ZB when RadioLive is boring (Saturday mornings usually). RadioLive had the worst summer programme and I listened to ZB more than usual but nothing I heard kept me tuned. If only one of them would give Miles Davis his own show………. I suspect you are right but Mediaworks are doing everything they can this year to build their audience. The combination of TV and radio may work very well for them and it’s one ratings war we’re very much looking forward to.